I held my annual Christmas card stamp-a-stack last Saturday and had a great turnout! I really tried to keep the cards sweet and simple - people who mass produce their Chrismtas cards need some quick and easy cards that still pack a WOW! This card was one of my favorites. I LOVE this!! It is perfect for a stamp-a-stack and just the right embellishments! It is lovely! Yes, it would be perfect for stamp-a-stack cards! Great clean and simple Chrissy card! TFS! 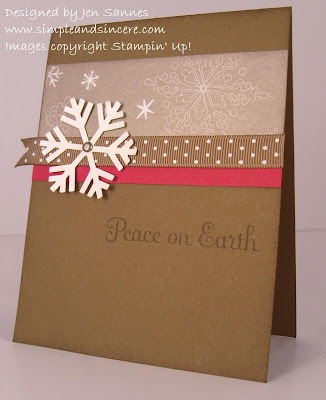 Do you have any ideas for a kid's Christmas party for the kids to make simple cards with stamps. I have a large varity of stamps, just need simple idea for our card decorating table at the party. Please email me kary1716 at aol.com. Thanks.